Think back on your experiences at museums, cultural institutions, or really any ‘attraction’ that you’ve ever visited… Which were your favorites? Which stimulated your senses and drew upon your powers of observation, curiosity, and excitement? As we grow our Garden and cultivate the messages we hold so dear from our mission, we’ll endeavor to up the ante in providing an engaging, meaningful and memorable visitor experience. After all, it’s likely those very same traits that caused you to recall your most enjoyable experiences during my opening line of questioning. Those traits are the keys to any good occasion, from educational workshops to tours or family-friendly special events. And what’s the real trick to creating those types of experiences that appeal to a broad audience at our Garden? Open windows to the natural world. One of our most successful windows has been our California native butterfly pavilion, now finishing up its fourth season with our grand finale on Sunday, July 28 – the chance for guests to help release our butterflies from the pavilion into the wonderful habitat that our Garden provides. When all is said and done, nearly 8000 guests will have experienced our butterfly pavilion during its two and half month run this late spring and summer. The time of sleepy summer days in our Garden has passed; gone are the days of 1500 total guests strolling our trails during summer months – this year we’ve welcomed nearly 15,000! The butterfly pavilion has created a draw for all ages, from grandparents with grandkids to young families with their toddling children, the appeal and magic of butterflies is universal. But what makes it an engaging, meaningful and memorable experience that furthers our mission? Simply put, it’s the chance to witness nature and the relationships that we often take for granted on display in a scale that we as humans can identify with and appreciate. Curiosity takes over and routine observations evoke thoughtful questions that include “how” or “why” (or are prompted by trained volunteers or butterfly experts on hand), which lead to “ah-ha” moments (one of the most rewarding expressions an educator can hear) and changes in perspective and attitude which, if fostered, can lead to changes in behavior, (drumroll…) ultimately improving the quality of our very existence. Too grandiose an expectation? Not really. Butterflies are an elegant tool to engage and educate a diverse audience. Butterflies beckon young and young at heart to ponder the relationships between plants, animals, and the intricacies that strengthen (or destroy) natural systems. The ties that bind butterflies to their immediate habitat, for instance larval host plants on which to lay eggs necessary for continuation of the species are undeniable. Those relationships describe an absolute necessity – without particular plants, particular butterflies (and ultimately other animal or plant species that depend upon butterflies) cannot exist. When guests are able to put a name to a plant, for instance milkweed, and come to understand that without milkweed, monarch butterflies cannot lay their eggs [though of course it’s not likely to observe monarchs naturally without relatively close proximity to milkweed species], “ah-ha” moments related to habitat and “what can I do to help?” are soon to follow. The list is lengthy - - mourning cloak butterflies and true willows (genus Salix), western tiger swallowtails and sycamores or cottonwood trees, or even our state insect, the California dogface and its larval host plant false indigo (genus Amorpha). Guest questions soon broaden: “Where can I get those plants?” “Can I grow that plant species in my backyard?” “What if I’m the only one in my neighborhood with butterfly habitat.. Does it still work?” A sense of wonder, a sense of purpose, a sense of possibly being able to change the opinions and attitudes (dare I say behaviors) of others? It is possible. Who wouldn’t want more butterflies in their backyard? Don’t miss this season’s final weekend of the butterfly pavilion July 27 and 28, 10 a.m.-3 p.m. Thanks to the generosity of Northern Trust, admission to the butterfly pavilion is FREE this weekend (general admission rates apply). At first glance it may not be the most breathtaking example of California’s botanical diversity, but Orcutt’s spine flower (Chorizanthe orcuttiana) finds itself amongst the states rarest plant species. This small prostate annual in the Buckwheat family (Polygonaceae) is endemic to coastal San Diego County, where it occurs in sandy soils, primarily in association with sandstone bluffs and southern maritime chaparral. With a listing of ‘Endangered” by both the federal Fish and Wildlife service and the California Department of Fish and Wildlife (CDFW), Orcutt’s spineflower receives the highest level of legal protection. Plants of this rarity are continuously monitored for, and the results are tracked by the CDFW. As of July 2013, 14 occurrences of this species are recorded, with only seven of these having been observed since 1980. A major goal for the Rancho Santa Ana (RSA) seed bank is to maintain viable seed collections of the states rarest plants. Prior to this season, only one population of Orcutt’s spineflower had been collected and put into long term storage at RSA. In 2013, we are targeting this species for ex situ preservation and have accessioned two new seed collections representing previously uncollected populations into the RSA seedbank. The first collection came from Naval Base Point Loma, under a program administered by the Center for Plant Conservation which seeks to store seeds of endangered plants found on Department of Defense lands. The seeds arrived as most collections do, mixed with bits of stems, twigs, and other chaff. Seed program staff, volunteers and interns quickly set to meticulously removing anything that was not a viable seed. Twenty seeds were set aside to be germinated to assess the overall viability, and the rest were placed in our dryer tanks, to be prepared to freeze for long term storage. The second collection was made at Torrey Pines Reserve in Del Mar. RSA staff members Evan Meyer and Duncan Bell met up with David Hogan of The Chaparral Lands Conservancy and Margaret Fillius of Torrey Pines Reserve to collect the seeds. This collection was made on maternal lines, which means that each individual plant was collected and will be stored separately, allowing the maximum research and restoration use. As we collected, we had to be on the look out for the Prostrate spineflower (Chorizanthe procumbens), a more common cousin of Orcutt’s spineflower. The pale green foliage and higher number of involucre spines of the Prostrate spineflower made distinguishing these tiny annuals relatively easy, although we had to work slow and make sure we didn’t collect the wrong plant. After we finished the seed collection, we took a few minutes to admire the beautiful coastal landscape and interesting plants such as Short leaved dudleya (Dudleya brevifolia) and White coast ceanothus (Ceanothus verrucosus). With the seeds back in the lab, and a little more experience cleaning this species, we were able to quickly get the seeds cleaned and processed for storage. The next step was to germinate a small sample of seeds to test viability. Seeds of spineflowers are found within a fibrous involucre (with attached teeth or spines, hence the common name). We felt that the involucres would impede germination and increase the likelihood of mold contamination as we germinated the seeds. Under the dissecting scope, with fine tweezers and surgical scalpel in hand, intern Monica Rodriquez skillfully removed the fragile seeds from the involucres. The seeds were then sewn on clear agar plates. Within a week, every seed germinated, indicating that there is no dormancy in fresh seed and that the viability is 100%. Creating a seed bank is one of many actions that will help protect Orcutt’s spineflower from the very real threat of extinction. This tiny plant is getting big help from Rancho Santa Ana and other plant conservation organizations. On the trip I learned a lot about more about GLORIA. The GLORIA project was first initiated at the University of Vienna in Austria in 2001. The goal of the project is to create a network of monitoring stations that use a standardized and universal protocol to detect changes in vegetation that are due to changes in climate. The project is now being implemented around the world with GLORIA plots in Africa, Asia, Australia, Europe, North America, and South America. California was the first to established sites in the western hemisphere with GLORIA plots established in 2004 in the White Mountains and in Yosemite National Park in the Sierra Nevada. There are now seven areas set up in California that will be resurveyed every five years. One of my goals in helping out with the GLORIA project was to find out how we can apply these methods to our high alpine summits in southern California. San Gorgonio Mountain in the San Bernardino Mountains rises just over 11,500 ft. This is our most significant alpine area in southern California with several species known only from the highest elevations and other species that have their southern most populations here. 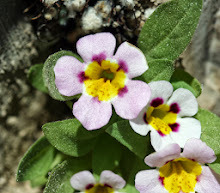 Having a GLORIA site in southern California will not only give us the tools to understand how climate change is affecting our local alpine species, but will also allow us to learn how changes here compare with changes around the world. To learn more about the GLORIA project in California you can visit this website, and to learn more about the GLORIA project globally you can visit this site. To see more pictures of my trip go here and here!